Venezuelan Food and Drinks: Venezuelan cacao back on TV as Willie "Raises the Bar"
Venezuelan cacao back on TV as Willie "Raises the Bar"
Venezuelan chocolate sales in the UK are expected to get a boost after funky new logos were unveiled recently for William "Willie" Harcourt-Cooze's 100 per cent cacao products. The launch coincides with a new three-part Channel 4 series called "Raising the Bar: Willie's Chocolate Revolution" and his brand new chocolate bars, which will be sold initially in Selfridges from 1 April. It's all about Willie now. The dogs that featured on the old wrappers for Willie's "Venezuelan Black" criollo cacao have been replaced by the logo "Willie's Supreme Cacao" in day-glo colours that tie in with the playful spirit of the Channel 4 documentary that helped launch the products in the first place: "Willie's Wonky Chocolate Factory". There is also added emphasis on explaining how to use the product. The labels carry the slogans "Grate in food" and "Great on food", urging consumers to experiment as Willie does by throwing a little cacao into their cooking as they might an expensive herb or spice. The contents of the three bars remain the same: Hacienda El Tesoro is made from cocoa beans from Willie's cocoa plantation near the beach resort of Choroni, while Rio Caribe Superior and Carenero Superior are single-estate beans sourced by Willie from other haciendas. The beans are imported directly from Venezuela and processed in Willie's chocolate factory in Tiverton, Devon. The rebranding and repackaging designs were created by Bristol-based Taxi Studio, who have already won several awards for the designs. As well as "Willie's Supreme Cacao" there are logos for "Willie's World Class Cacao", "Willie's Rambunctious Cacao" and "Willie's Delectable Cacao", suggesting the success of the products has injected a greater confidence in the marketing. Willie has certainly done well, the 100 per cent cacao bars are modelled on the traditional cylinders of home-made cocoa sold from people's homes or small shops in Venezuela's cacao-producing areas as a source of extra income. In Venezuela, these are simply grated into milk and used to make hot chocolate. 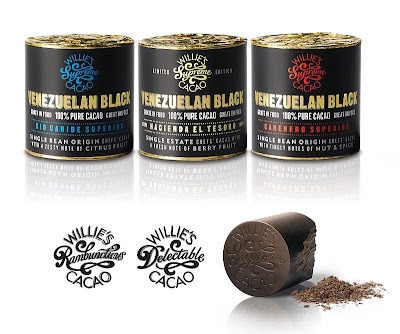 By focusing on the prime quality of the cocoa beans and marketing his "Venezuelan Black" bars as a gourmet cooking ingredient, Willie has effectively introduced a brand new product into the UK market. Buyers now see "cacao" as something separate from cocoa, and that's all down to Willie. So it was no surprise to learn that he picked up the 2008 "Chocolate Personality of the Year" award at the Academy of Chocolate's annual prizegiving ceremony, which must have been sweet. Willie's new Channel 4 documentary series will be shown on 7 April, 8 April and 9 April and follows the wonky entrepreneur as he produces his first real sweetened chocolate bars: the Rio Caribe Superior chocolate bar, which is 70 per cent Venezuelan cacao, and a 72 per cent Peruvian San Martin chocolate bar. "Will Willie get the funding and new equipment necessary to produce his new bar; can he persuade retailers to stock it; and will the public change their tastes? Can one individual, no matter how passionate, really hope to take on the chocolate giants and win?" Well it seems he can. Priced at £3.49, the bars will go on sale at Selfridges on Oxford Street on Thursday, 2 April and interest in the launch is huge. Already more than 1,500 people are on a waiting list for the first 3,000 bars. Selfridges food and restaurants director, Ewan Venters, told reporters that the store has set up a new customer phone line to cope with the expected flood of orders and manage the waiting list. "Willie's two bars will be a huge hit. This time last year his bars, which require customers to cook with them, became our food hall's fastest-selling line," he said. Expect mayhem then when Willie visits the Selfridges food hall from 1:30 to 2:30 p.m. on Saturday, 18 April, to sign copies of his new book "Willie's Chocolate Factory Cookbook." The book combines recipes that use his cacao bars with the story of how he and his wife Tania bought a remote hacienda in Venezuela and started the journey that has brought him back to the UK as a famous TV star and "the nation’s most-loved chocolate chef" as Selfridges calls him. Willie is also working on a hot cocoa drink called "Get-Up & Gocoa", which he told Waitrose's Food Illustrated magazine "will be as close to Aztec cocoa as you can get." "The conquistador Hernan Cortes said: 'An army can march all day on one glass of chocolate'. It wasn’t until hundreds of years later that it was made into bars. I’m taking chocolate back to its roots," Willie added. The word cacao was taken by the Spanish from the Aztec word "cacahuatl" but Aztec cocoa was very different from the hot, sweet beverage we enjoy today and was usually served frothy, cold and laced with crushed chili peppers. Now, if Willie can get my old mum to sip an Aztec cocoa while curling up on the sofa watching his new series he really will have raised the bar. "Venezuelan Black" is currently available in selected Waitrose supermarkets and Selfridges store in London. The website williescacao.com is currently under construction. Hi, watched the programme and cant wait to try the chocolate. Does willie have an email address as I would love to know does he have a sister or cousin called Arabella ?? If so, I was in school with her in Ireland. Cocoa beans from the Cacao tree - just how is cacao different from cocoa? A clever piece of marketing to create a niche product at premium prices for chocolate snobs. cant wait to try real chocolate,watched all 3 of your programs.keep up the good work. Loved this series but it was Willie's cocoa farm in Venezuela that made it for me. O my god what a beautiful place. Googled Venezuela and found your blog. You have excellent links to Venezuelan music so thanks for that. I have been searching for a source. I stayed in a great little hotel in Camberwell, South London called the Church St Hotel (strong Mexican/Cuban theme) and they play South American music via internet radio. Could it have been a Venezuelan station? Great music!